Epigraphist Dr. Essie DeSpencer, travels to an ancient Welsh castle in order to decipher an Ogham inscription discovered by the handsome and enigmatic, Garreth ap Daffyd. But the journey is not what she anticipated. 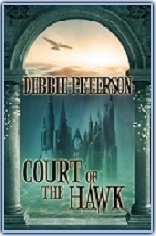 She doesn’t expect to fall for the Lord of the castle, or to find herself deeply entrenched in legends, myths, and magic. Real legends, and real magic, that have devastating consequences. Now available on Audio through Amazon, Audible & ITunes! Debbie has always had a soft spot for fairy tales, the joy of falling in love, and happily ever after endings. Stories of love and make believe filled her head for as long as she can remember. However, it was her beloved husband who encouraged, cajoled and inspired her to take up a pen and write some of them down. Her journey to published author could fill quite a few pages. However, in June of 2010, she submitted her debut novel “Spirit of the Rebellion” to The Wild Rose Press, her second to Inkspell Publishing, and the rest is history.